In honour of her 97th birthday (Jan. 17), we look back at our cover story featuring the white hot Betty White: A rabid fan of The Golden Girls gets his chance to rub elbows with Betty. But the journey to TV nirvana could be a sitcom in itself. Cue the laugh track. Back in 1985, I happened across a newspaper article about a new sitcom that would be making its debut that fall season. 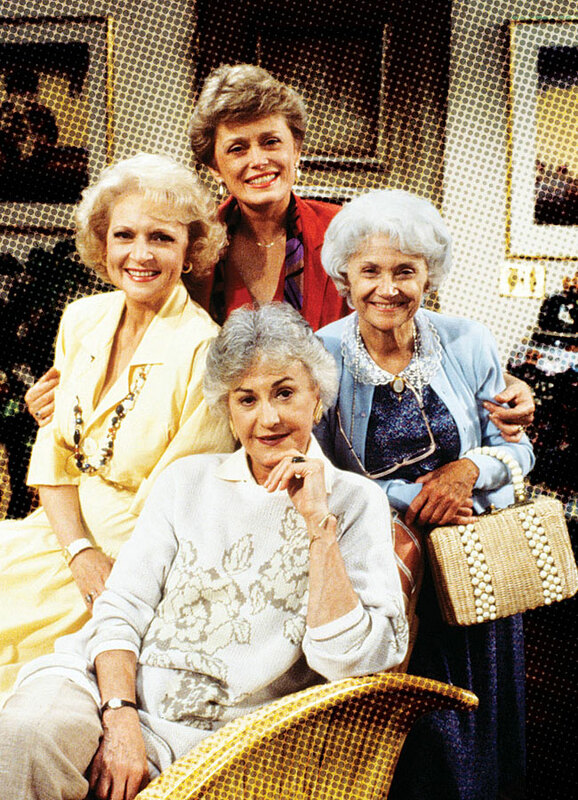 The show’s premise would revolve around four elderly women living together in Miami and would be called The Golden Girls. As I read about it, my know-it-all teenage self smirked, and I said sarcastically, “Oh yeah, there’s a hit waiting to happen.” Why would anyone find the lives of four senior-citizen roommates interesting, much less humorous, I sneered. Little did I know, many years later, my adult self would pay a price for the arrogance of that fleeting dismissive attitude. Somehow, I did catch the show, which aired on Saturday nights, found I loved it and quickly became obsessed with it. Even stranger, I soon discovered, was how many young people loved the show. I realized what a global phenom it was when I took a backpacking trip in Europe in my early 20s where I befriended a group of kids from New Zealand, and we regaled each other with tales of our favourite episodes. I think my love and appreciation for this sitcom even increased well into adulthood. It was like comfort food. Naturally, when the DVD boxed set came out, I bought the entire series to watch any time I liked. (Yes, my obsession pre-dated Netflix and YouTube.) Simply put, I was a huge fan of the show. Then the retribution for that earlier teenaged attitude began to take shape this past spring. I came across a tweet, announcing that the last surviving member of The Golden Girls, the lovely, talented and still-working actress Betty White, would be doing a live reading of an episode of The Golden Girls. She would be joined by the cast members of her current sitcom, Hot in Cleveland, who would be reading the other three characters from the Emmy Award-winning hit show, which ran on NBC for seven years. I decided this was a golden opportunity—pun intended—to see a living legend, the last remaining Golden Girl, Betty White in action. And as she epitomizes the Zoomer philosophy, why not get an interview out of it? But this proved easier said than done. After a flurry of email exchanges with a publicist at CTV Two, the Canadian network that airs Hot in Cleveland, to secure some face time with the actress, I finally got an answer: yes, you’ll have a short interview but via telephone with Betty. And, yes, we can get you into the studio for the live reading, for which I was grateful since the show—now in three days time—was sold out. Within 48 hours of confirming this, I was gleefully winging my way to L.A. I felt it was one of those circle-of-life things you read about. A lifelong obsession would now be consummated. It couldn’t be more perfect. During a change of planes somewhere in America, I checked my email. Things looked even rosier. A message indicated that I would be escorted backstage before the reading. I would get to meet Betty in person, after all! I continued the flight elated. But when my flight touched the ground in L.A. not only did I come down to earth literally but figuratively. Once I checked into my hotel in Beverly Hills, I was greeted with email apologies. No, you cannot go backstage to meet Betty and the cast. And, no, we do not have a ticket for you to attend the show. As I paced my hotel room, with the crashing realization that this entire trip was wasted, I pondered how it could all have evaporated in a few hours. That’s when that little thought I had as a teenager popped back into my head. I laughed aloud. Oh, the irony. Here I was ready to jump through hoops to meet a little old lady that I once dismissed as irrelevant but has since proven to be a hot commodity in Hollywood. Somehow in my panicked state of mind, I realized I’m in a city where people don’t take no for an answer. Indeed, there are people who dedicate themselves to entire careers to ensure that people in L.A. don’t have to hear the word no. And there was such an individual in my hotel. I marched down to the concierge. I laid out in no uncertain terms there was a sold-out show I needed to attend. Sure enough, this cheery woman got me a ticket. I tried not to blanche at the four-figure sum being asked and handed over my credit card. But it turned out my premium-priced ticket was just that. At the show later that night, I was not in the audience but was seated at my own private little table and chair on the soundstage of the set of HIC. A large bottle of vodka sat on the table, tempting me to take a swig, just to celebrate the wave of relief I felt that I was actually there. l-r: Wendie Malick, Valerie Bertinelli, Betty White, Jane Leeves in “Hot In Cleveland.” Photo: TV Land/courtesy Everett Collection. And then there she was. With her HIC cast mates, Wendie Malick, Valerie Bertinelli and Jane Leeves leading the way, Betty White took her seat at the long table where they would be reading the classic Golden Girls script, “Blanche and the Younger Man”—written by a writer who now works on HIC. Instead of playing her character Rose Nylund, Betty was playing Dorothy (originally portrayed by Bea Arthur); Leeves, Dorothy’s mother Sophia; Bertinelli, Rose; and Malick, in an astute bit of casting, played the sexpot Blanche. I left the event on a high note. My elation continued when I returned to the hotel to find an email from the publicist stating TV Land, the cable network behind HIC, had now agreed to a 10-minute in-person interview with Betty two days later at the CBS Studios where the show is filmed. I agreed, despite the fact I was scheduled to leave L.A. the next day. I showed up at the appointed place promptly. A handler told me I had five minutes interview time and not to take any cellphone pictures of Betty since her hair and makeup were not done as yet. Next, I was escorted into a small sitting room, and Betty, dressed in a floral print dress, was sitting on a couch. Her smile was wide and warm as she greeted me and shook my hand. If the room was decorated in pastels with a few pieces of wicker furniture thrown in, I might have felt I was having tea with the warm Rose Nylund. Except instead of the perpetually clueless and naive Rose, the woman before me is sharp as a tack and self-deprecatingly funny. Despite being told her hair and makeup were not finished, I found her looking immaculately camera-ready. “It only took nine people to make me look this way,” she says dryly. I ask her how it felt returning to her Golden Girls days a few nights ago at the reading. “It was a bittersweet thing. It was a funny thing playing Dorothy—she was strong, she was the crux of the whole thing—but I always wanted to drop my voice down here,” and she lowers her voice to that distinctive Bea Arthur gravelly pitch. But it was fun going back for one night, she says. “It’s so tough to realize that they are not there any more and they are in my heart and mind and head—they are so much there. But it was great to play it with these girls,” she says, referring to her HIC cast mates. “I’m so lucky to have another group of women to work with. Of all these distinctively different and lovable characters she played, did she have a favourite, I asked. And I included Ellen Jackson, a character she briefly played in the sitcom Mama’s Family that ran for five seasons in the 1980s. Whether you chalk it up to luck or hard work, White’s career has been a stellar if not a ground-breaking one. At age 92, she is still working in Hollywood and in an industry that puts a premium on youth. But after more than seven decades working in show business one would think it gets easier for a veteran performer like White. But audiences keep having a hankering for more Betty White. Rue McClanahan (Blanche); Betty White (Rose), Estelle Getty (Sophia), Bea Arthur (Dorothy), Photo: ABC Photo Archives/ABC via Getty Images. Having steadily worked throughout the years after The Golden Girls, Betty became white hot again after she appeared in a hilarious candy ad that ran during 2010’s Super Bowl. Audiences responded so favourably that a Facebook campaign started to get her to host Saturday Night Live, which she went on to do, making her the oldest person to do so. The same year, she signed on initially as a guest on Hot in Cleveland but is now a regular on the hit sitcom, which has entered its sixth season. In addition, she hosted the hidden camera prank show, Betty White’s Off Their Rockers, where a merry band of senior citizens played jokes on youngsters. To what does she attribute this longevity and popularity? “I think I’ve been around for so long, as kids grow up they have always seen me so they go, ‘We know her. She’s a friend,'” she says. White is part of a growing or, at least, more visible group of men and women who are challenging our views of what life after 80 and, yes, 90, means. The New York Times Magazine recently ran an editorial called “Old Masters,” highlighting such luminaries as T. Boone Pickens, chairman of BP Capital Management, 86; former Zoomer cover stars Tony Bennett, 88, and Christopher Plummer, 84; artists Ellsworth Kelly, 91, and Carmen Herrera, 99, all of whom seem to share whatever it is that keeps Betty White her lively self. And just what that is has been the subject of a study called 90+, featured on a 60 Minutes segment that aired last May. The study revealed that those over 90—known as the “Oldest Old”—are the fastest growing segment of the U.S. population. A few of the key findings don’t seem particularly groundbreaking—15 to 45 minutes of daily exercise, moderate drinking and not smoking. And maybe the fountain of youth is the sum of all these parts: being active in body, mind and spirit as well as maintaining an engagement in the world at large. If Betty did tap into an elixir of youth, she credits her parents. “They evidently had great genes because I’ve been healthy all my life. I never take it for granted.” After the death of her third husband, White is single and has three stepchildren. But how does she maintain a desire to still work and not retire and enjoy her spoils? There is no doubt about it, Betty maintains a working schedule—including her role as a tremendous animal advocate—that would put to shame anyone a fraction her age. So was it worth it? Absolutely. If anything, Betty White not only helped me relive a special bit of nostalgia from my teen years but reminded me that getting older is getting better all the time.